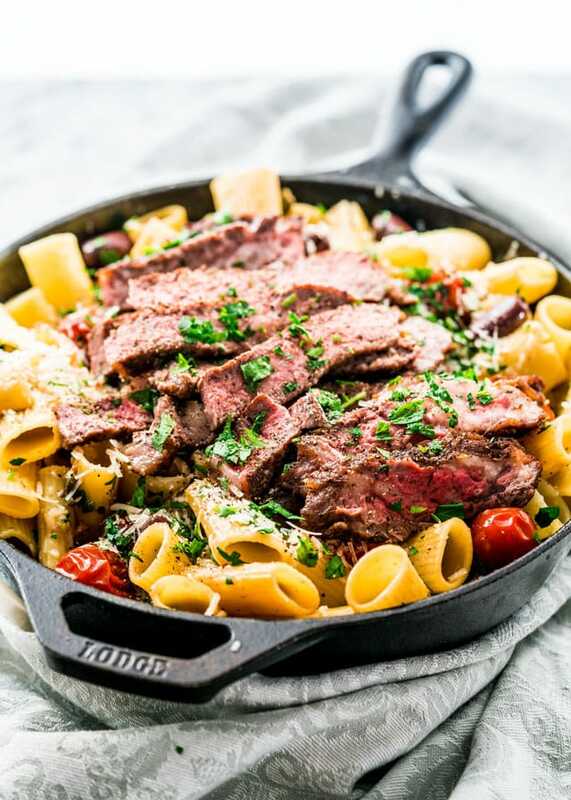 This Ribeye Steak Pasta Puttanesca is perfect for the meat eater in your life and simple enough for a fabulous weeknight meal. 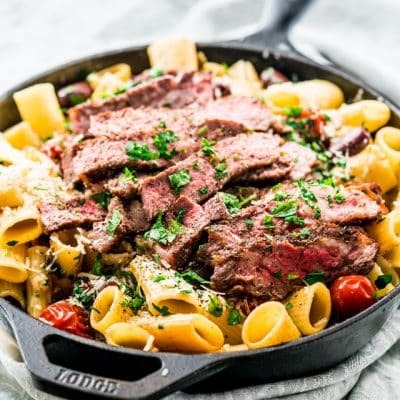 A classic and simple pasta dish with cherry tomatoes, olives and capers and a perfectly pan fried ribeye steak. Living in Alberta has its perks. While the weather is not always ideal, I sure do love the Alberta blue skies, we must have the most sunny days in a year. Another Alberta perk that I love is the awesome beef. Some may even say that we have the best beef in the world. Who am I to argue with that statement? All I know is that we sure do have a lot of cattle around here. Pretty much everywhere you drive around Alberta, all you see are cows and hay. I usually love a good steak and often I’ll buy a good ribeye steak and grill it for hubs and I. I like the ribeye because it’s quite flavorful and tender. It usually has a marbling of fat which makes it very good for fast and hot cooking. Which is why I pan fried this ribeye steak in butter and olive oil over high heat. That sizzle gets me every single time. I could have grilled the steak, but every once in a while I like a good pan fried steak. Funny thing is that before we moved to Alberta, I hardly ever ate steak, pretty much never. Steak was something my mom made for my dad every Saturday, but we never really touched the stuff. Once we moved here, everyone was telling us how good the beef here was and how to pick a good steak. The rest was history. Once we tried the beef here, we never looked back. We still don’t have it all the time, but when we do I do love it medium rare or medium, and usually we’ll make a nice salad alongside it. For some reason when I bought this gorgeous piece of steak all I kept thinking of is sautéing some tomatoes with garlic and capers with it. 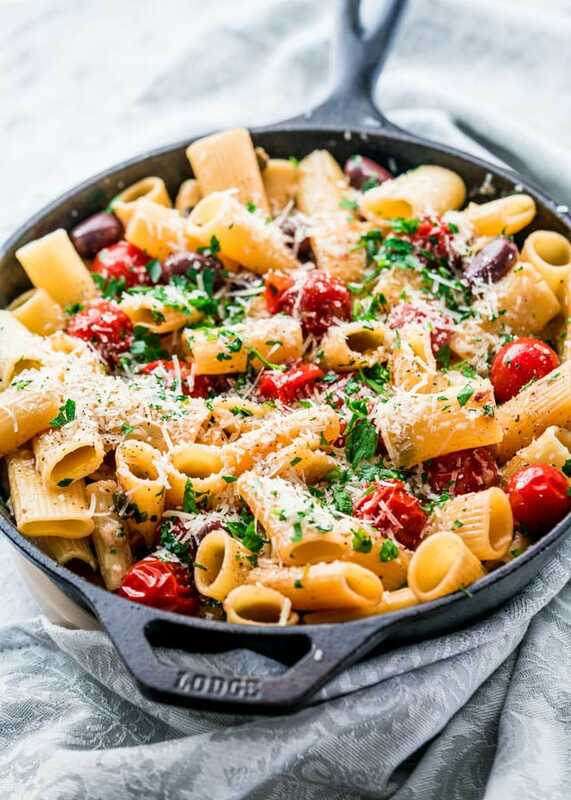 I went a step further with this recipe and added some pasta, to make it a heartier meal. The flavors are amazing, while ingredients are quite simple. It goes back to my favorite concept when it comes to cooking and that is that simple is best. What’s your favorite cut of meat when it comes to steak and how do you like to cook yours? Cook the pasta according to package instructions. Drain in a colander and rinse it under cold water to stop it from cooking any further. Reserve about 1 cup of the pasta water. Season the steak generously with salt and pepper on both sides. Heat the skillet on high heat then add the butter and olive oil. Once the butter has melted and the pan is really hot, you should see wisps of smoke, add the steak and cook the first side for 5 minutes, flip over and cook for another 5 minutes. 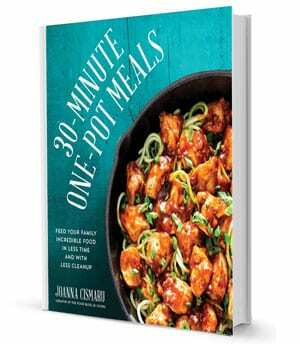 See recipe notes on cooking time. 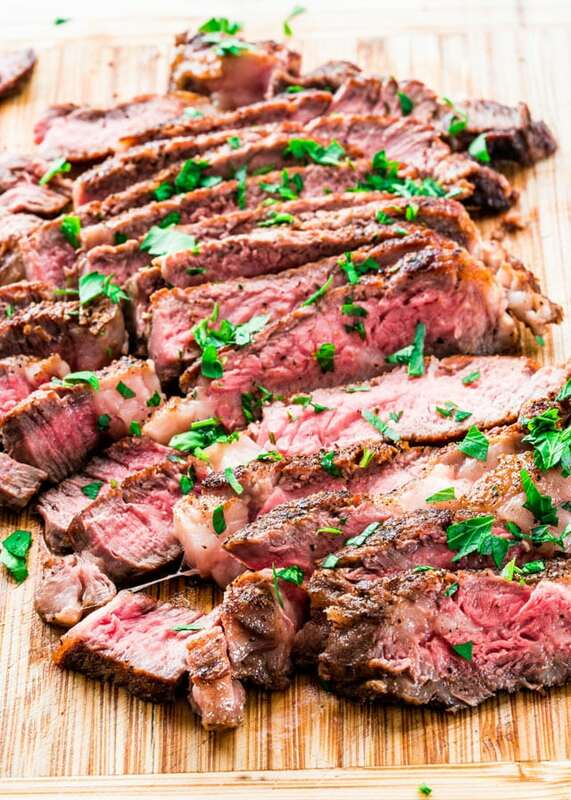 Transfer the steak to a cutting board or plate and cover with aluminum foil. Do not slice it right away as all the juices will come out and you'll end up with a dry steak. Wait at least 5 to 10 minutes before slicing into it. Drain the skillet and add another tbsp of butter to it. Once the butter has melted add the garlic and saute for about 30 seconds until the garlic becomes really aromatic. Add the tomatoes, olives and capers to the skillet then season with salt and pepper. Saute for about 2 minutes until the tomatoes soften and the skins begin to wrinkle a bit. Add the pasta, reserved pasta water, Parmesan cheese and parsley to the skillet then toss everything together. Remove the foil from the steak and slice it across the grain using a sharp knife that will cut cleanly through the meat. Slicing across the grain will yield the most tender slices. 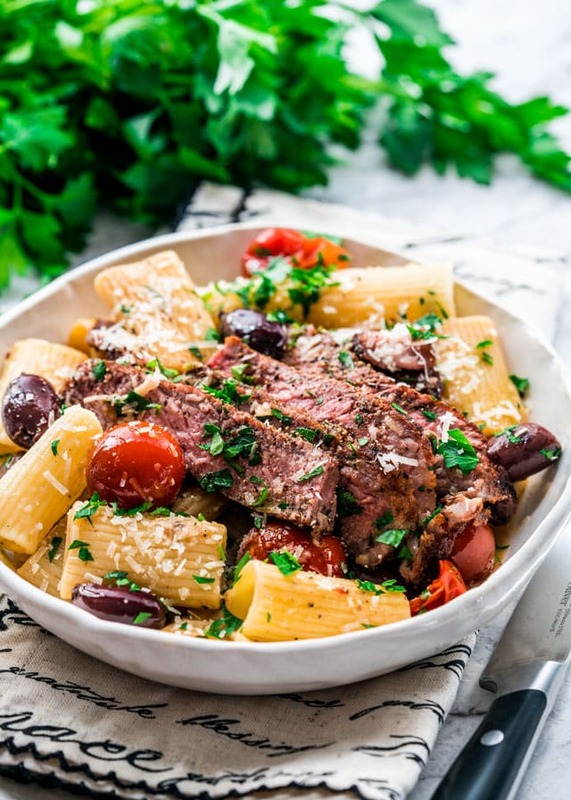 Place the steak slices over the pasta and serve warm. Although I used a steak with no bone, a bone-in steak would work just as well. Cooking time for steaks can vary drastically depending on the size and thickness of the steak. My steak was a bit over an inch and thickness and it was almost 1 1/2 lbs in weight. Because it was a thick cut of meat, it required the full 5 minutes per side to cook so that it's a medium rare. If your meat is thinner you may need less time per each side. One thing to keep in mind though when pan frying a steak is that your pan needs to be really hot. The ribeye steak can also be grilled over a hot grill for 4 to 6 minutes per side to end up with a medium-rare steak. Grill longer if desired for a medium or well done steak. Refrigerate leftovers in an airtight container for no more than 3 to 5 days. I looked online and there’s different types of capers. Non-pareil and capote. 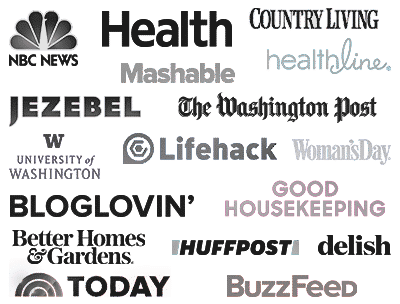 Does it matter which type I use? Thanks! No, it shouldn’t matter which ones you use. We made this tonight. It was so delicious. This was my first visit to your website. I look forward to trying more of your recipes. Thanks so much! It looks so good! i will try to do it for my wife this weekend, she will love it! I made this dish for my family yesterday, and it was delicious. My Foodie Family said to keep this recipe because it was so delicious! I did use thick cuts of top sirloin instead of ribeye, because I do not like the fat content in that cut of steak. So glad you liked this and yeah any cut of meat would work, whatever you prefer.